You won’t often come across tomatoes stir fried with eggs on a lot of Chinese restaurant menus (at least in the west) but this dish, in various permutations, is actually extremely popular in China. Indeed, it is one of the most common dishes on the menu in factories and schools across the Chinese Republic and many Chinese say that it is the first dish they ever learned to cook. It is, I suppose, something of a comfort food in that nation and it seems to be popular at any time of the day. I want to point out, here, that the title of this post is not a misprint or mistake. Rather, I have decided that, when cooking dishes that are inspired by Chinese cuisine that I will adopt the syntax that best reflects the actual Chinese name. I recently described this convention in my review of Buwei Yang Chow’s ‘How to Cook and Eat in Chinese’ and it is something I would love to see adopted in Chinese restaurants and cookery books in the west. 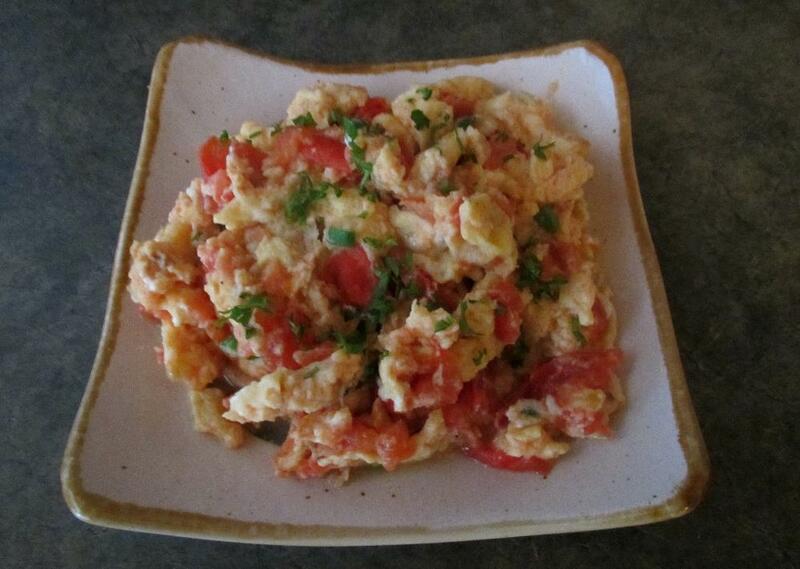 Tomatoes stir-frying eggs is, in Chinese, most commonly rendered as 蕃茄炒蛋 (fānqiéchǎodàn). The 炒蛋, means stir-fried egg but is actually best translated as scrambled egg, while fānqié, meaning ‘foreign eggplant’, is a common name for the tomato. One can also find the tomato referred to as the ‘western red persimmon’ (xīhóngshì) or 西红柿, but this is less common. 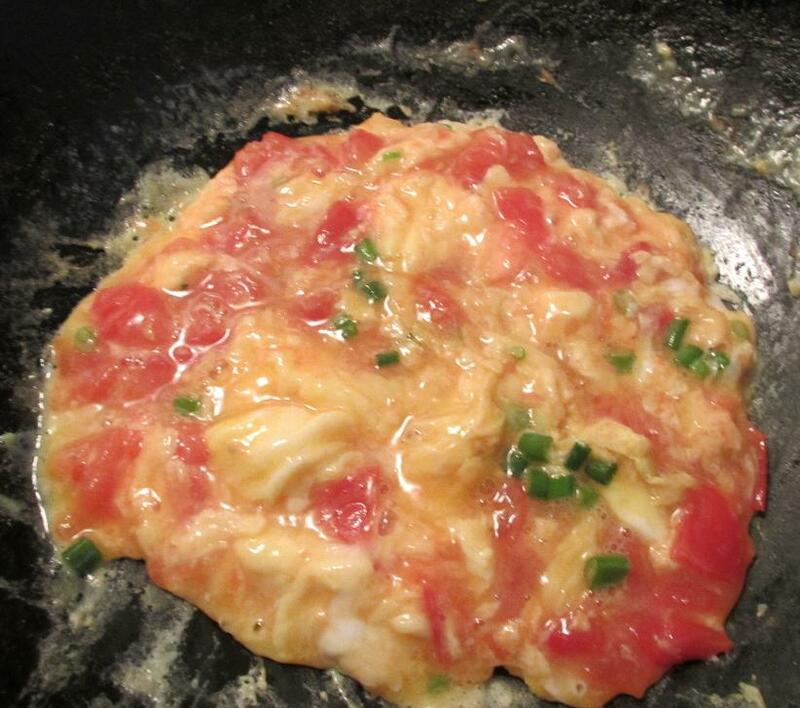 The basic technique for this dish is to simply fry chunks of tomato briefly and then toss them with egg. In practice, though, other ingredients are usually added and salt, pepper, sugar, scallions, oyster sauce and even shrimp are frequent additions. Naturally, like the western omelet, any ingredients can be added according to taste (or imagination) and, in this rendition, I add one very non-standard ingredient in lieu of the fairly common oyster sauce. Oyster sauce is a lovely addition, and one my wife often adds when she makes this dish for breakfast, but I find it can add an unpleasant darkness to the eggs. 1 ½ tbsp. Korean salted baby shrimp. The last ingredient is the non-standard one (and may be unfamiliar to some readers). I will be featuring it in a ‘Foodstuffs’ post in the near future. I use this fermented seafood ingredient instead of oyster sauce in order to avoid the dark color I spoke of above, but I do not use the shrimp in the whole state as the shells are a bit tough. Rather I squeeze them to yield about a tablespoon or so of juice that is then added to the eggs. If you do not have, or are reluctant to use the somewhat pungent shrimp juice, then, by all means, use a couple of tablespoons of oyster sauce instead. In that event, you may wish to omit the sugar, as the oyster sauce is fairly sweet on its own. First, beat the eggs along with the scallion, sugar, and the shrimp juice (or oyster sauce, if that is what you are using). Next, heat your pan to medium and add about two tablespoons of oil. Use vegetable oil, if you wish, but rendered pork fat will make the dish much more tasty. 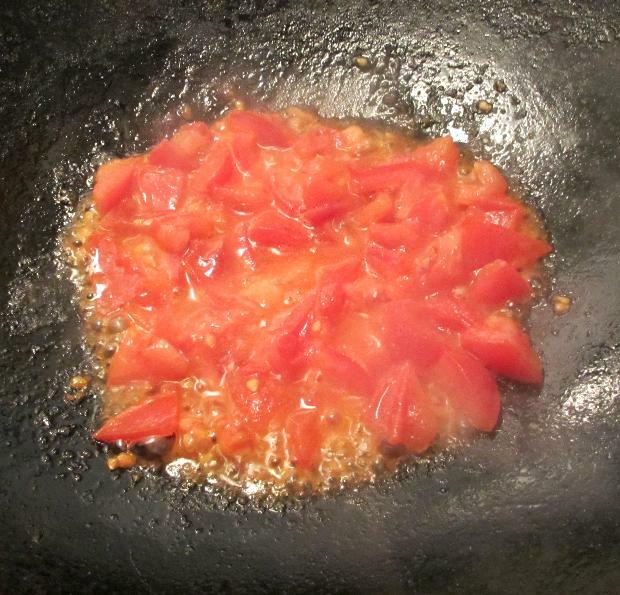 Once the oil is rippling, but before it starts to smoke, add the tomatoes and stir-fry until they are soft, but not mushy. At this point, the juices they have thrown off will be deliciously thickened. If you have elected to remove the seeds from you tomatoes, the sauce will not thicken quite as nicely so you may want to add at least another half tomato in order to increase the juice quotient a little. 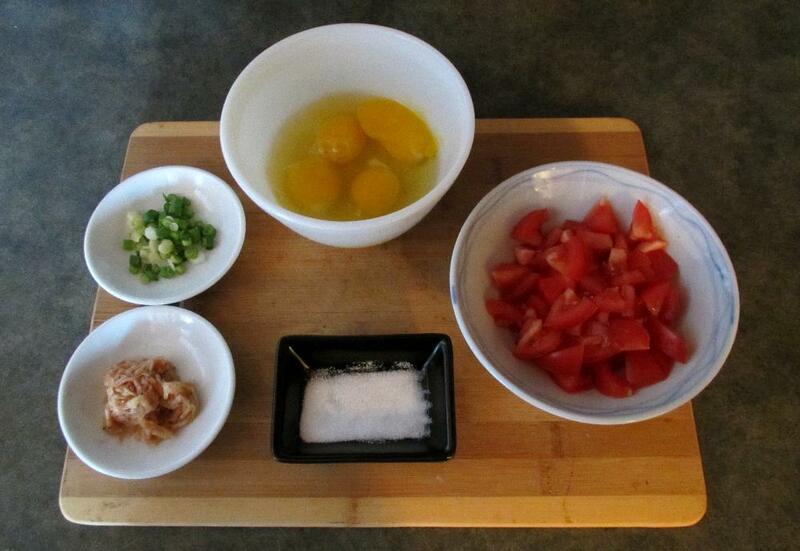 When the tomatoes are nicely done, spread the pieces as far apart as possible in your pan and pour in the egg mixture. It is very important that you do not start stirring and tossing the eggs right away, as you want the final dish to have thick, fluffy curds rather than small fragments of cooked egg. Instead, let the mixture sit for a moment until the bottom starts to set and then run your spatula in crisscross lines through the mixture to break it up in large chunks. Turn these, let the bottom cook again and then repeat the process several times until everything is cooked through. Plate, and garnish with a little chopped scallion or parsley. As to the tomatoes and eggs, it is pretty hard to follow the basic steps given above and turn out anything other than a delicious result. This time I added only 1 slice of scallion (because that is all I had) but my wife very specifically said that there was not nearly enough of this ingredient. 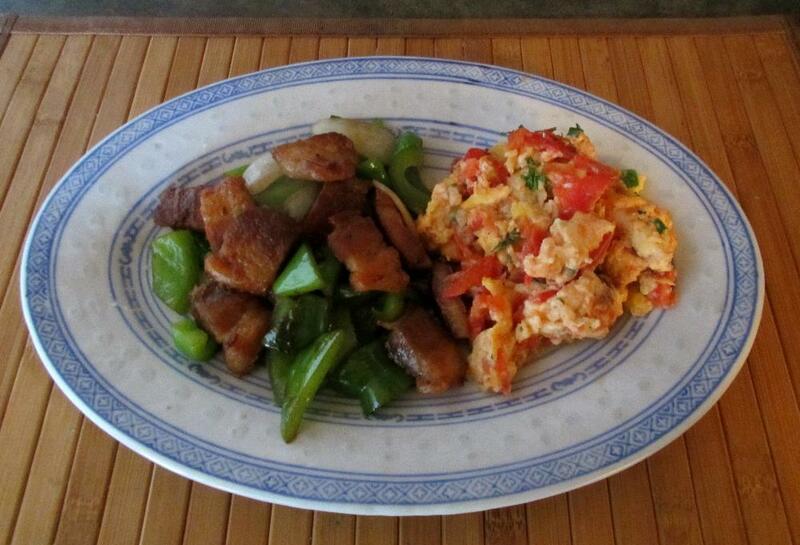 She makes this dish as a breakfast fairly often and always says she makes it better than I do… However, she also said that, although she prefers oyster sauce as an addition, she rather liked the fermented shrimp juice as a substitution. That looks really tasty! 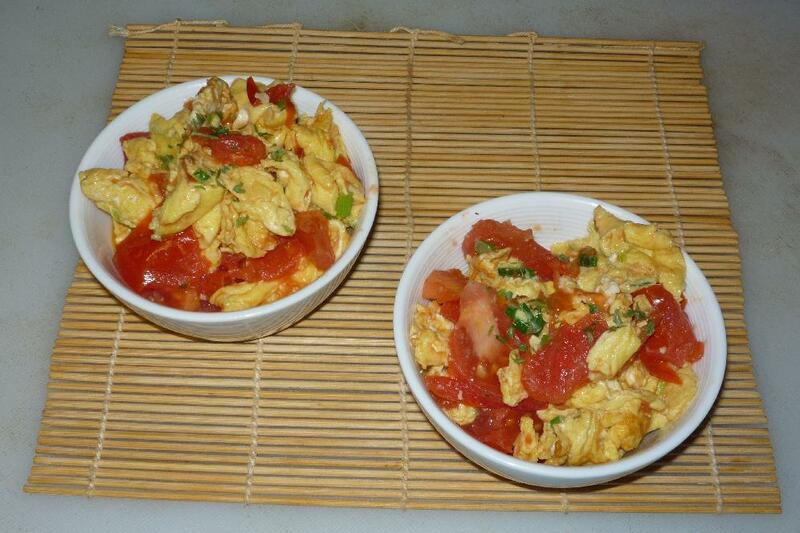 I wouldn’t have thought of stirfrying tomatoes and eggs together but the picture made my mouth water! Thanks for sharing the recipe; it sounds perfect for a weekend brunch. It’s nice with a bit of green pepper in it too! Definitely a comfort food for many people. My wife and I tend to have it for lunch or supper. It would be just as delicious at any time of the day. I’m one of those people who will eat breakfast food for dinner.